The building at 123 Wynford Drive was constructed in 1963. Designed by world- renowned architect Dr. Raymond Moriyama for the Japanese-Canadian community’s cultural centre, it received international acclaim for its inspired architectural form and the way in which it combined modern and traditional. A sense of spirituality and harmony transcending cultural differences pervades the building and is felt immediately. 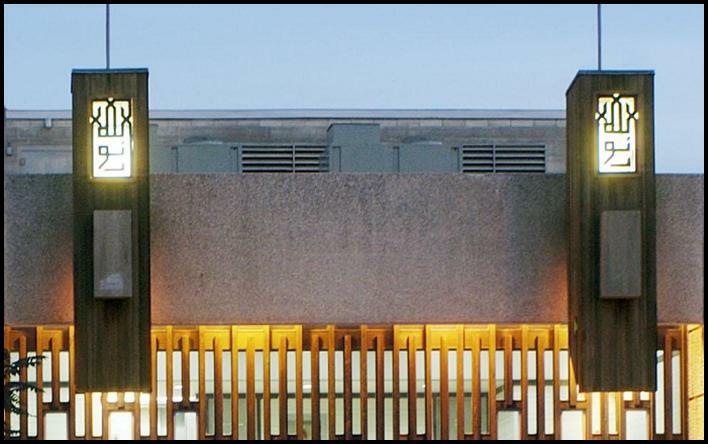 When it became available as a result of the Japanese Canadian Cultural Centre’s relocation to larger premises, a wonderful opportunity to acquire a landmark, beautiful piece of architecture for housing the Noor Cultural Centre became possible. In July 2001, 123 Wynford Drive was purchased, and Dr Raymond Moriyama’s architectural firm was commissioned to renovate and adapt their original masterpiece to suit Noor’s objects as an Islamic cultural centre. The Arabic word Noor refers to spiritual light. One of the themes for the renovation, therefore, was to enhance the quality of light already present in the building. One of the main strategies was to use wood screens to alter the quality of light. The architects designed a variety of screens incorporating ancient Arabic calligraphy. The two lanterns at the building’s main façade now have screens with the words Allah Noor. 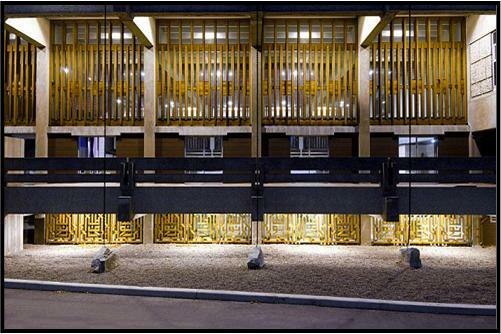 A large wood screen, again with calligraphy, is installed along the exterior window of the new prayer hall and is lit at night. This new screen at the building’s base is aligned exactly with the existing vertical screening above. These subtle details allude to Islamic building traditions, yet are well suited to the building’s architecture. The renovation included a new prayer room, ablution rooms, wheelchair accessible washroom, children’s area, caretaker’s suite, resource centre, barrier-free ramp, and elevator.